Recently, high-profile investigations have brought tax evasion to the forefront of the public consciousness. Paul Manafort and Michael Cohen, confidantes of President Donald Trump, were found guilty on counts of tax fraud and evasion, among other crimes. These investigations raise questions about why these individuals thought they could get away with tax evasion and why they only got caught after becoming entangled in separate investigations. One reason seems to be that when it comes to policing high-end tax evasion, there are nowhere near enough cops on the beat. People who live in a society in which there are drug laws are living in an unfree society no matter how much they believe otherwise. That’s because, in a genuinely free society, people have the right to ingest whatever they want without being punished for it by the state. As I observe the Alabama Legislature, it occurs to me that I am getting older. A lot of the legislators and lobbyists I have known over the years have moved on. Montgomery is no longer an “Old Boys Club.” A cursory look at a typical day at the Alabama Statehouse would surprise you. An increasing number of professional women are a major part of the lawmaking process. There is a host of brilliant women under 40 that is at the forefront and yield a great deal of influence over the process of policy-making in Alabama. Unintended consequences are a common problem when it comes to making laws and government policy. A good example of this is the changes lawmakers made in 2012 to the retirement systems for education and state employees in Alabama. The economic recession that began in 2008 had severely hurt the Retirement Systems of Alabama’s investments. The slowness of the recovery made things worse, and the state was looking at a situation where, in the long run, the government wouldn’t have the money to pay education and state employee retirees the benefits they had earned. The Hugging Senator. I have been called The Hugging Senator over the years. The Hugging Senator title reflects an important part of how I interact. It reflects a key part of my being. My hugs say, “I care about you.” And that is very important. The Hugging Senator. I recently began to reassess The Hugging Senator. I talked with several women about it. I sought their advice about The Hugging Senator. I will share some of their responses later in this Sketches. I believe that hugs are very therapeutic. Hugs make us feel better. Hugs make us do better. Hugs make us be better. Hugs impact our mental, emotional, physical, and spiritual health. Hugs are really powerful and therefore important for all the population, men as well as women. As the debate over socialism between President Trump and his potential Democratic presidential opponents heats up, we shouldn’t forget a socialist program that Trump and other conservatives have come to love — the school voucher program. Like other welfare-state programs, vouchers are based on the socialist concept of using the force of government to take money from one group of people and using it to pay for the education of another group of people. The irony is that conservatives justify their socialist program by saying that it is being used to save children from the disastrous consequences of another socialist program, public schooling. Russia is a relatively weak state on the international stage. A former great power, today it has a gross domestic product roughly equal to that of New York state; this feeds into the country’s insecurity about its role in the world and its economic and military strength compared with those of its chief competitors. Russia knows it cannot compete with the West on an even playing field. Thus, it has developed a shadowy, asymmetric strategy to subvert opponents and alter the global status quo. A key part of this approach is the country’s strategic use of ambiguity. As the United States responds to these attacks and seeks to prevent future ones, it must take into account that public transparency, as well as its relationships with allies, are integral to any effective response. There is no question that Gov. Kay Ivey’s infrastructure/gas tax program was the cornerstone issue of this legislative session. This monumental legislation will be a tremendous enhancement for Alabama’s economic development for decades to come. Governor Ivey and the legislative leadership deserve accolades for addressing this important issue. They were indeed thinking of the next generation rather than the next election. Governor Ivey deserves most of the credit. She reached across the aisle and garnered almost unanimous support from the Democratic legislators. Indeed, the legislation passed the House on an 84-20 vote and passed 28-6 in the Senate. However, other major issues will be on the table. The Alabama Department of Corrections is seeking a $42 million increase in its budget in order to hire much needed additional correctional officers. A federal judge has ordered the state to increase the number of guards and mental health professionals. There has been a recent spate of attention to court packing, stemming largely from remarks by former Attorney General Eric Holder and other prominent progressives about adding justices to the Supreme Court. While these comments highlighted the need for a broader discussion about court reform, the conversation they generated has lacked important context: Court packing is not a theoretical possibility but rather an ongoing effort by conservatives happening right now. Last week, the Washington Post carried a story about five Democratic presidential candidates who took to a stage in Iowa to address an audience that was filled with farmers who are suffering severe economic and financial distress. The title of the article says it all: “No Democratic Candidate Has Been Able to Figure Out How to Help Farm Country.” The candidates were Julian Castro, John Delaney, Amy Klobuchar, Tim Ryan, and Elizabeth Warren. Not surprisingly, the five proposed “solutions” that involve more government intervention. They just don’t get it. They don’t understand that it is government intervention that is the root cause of farmers’ woes. How is more government intervention going to be the cure for a problem that is caused by government intervention? It’s like giving a patient who has swallowed poison more poison. Last week, a Wall Street Journal editorial revealed the incorrigible hypocrisy with which conservatives have long suffered. Conservatives, of course, have long suffered this malady with respect to domestic policy given their ardent devotion to Social Security, Medicare, foreign aid, and other welfare-state programs even while decrying the left’s devotion to socialism. But this particular WSJ editorial revealed the incorrigible conservative hypocrisy with respect to foreign policy. After he served his sentence, the Alabama Voting Rights Project, a partnership between the Southern Poverty Law Center and the Campaign Legal Center, walked him through the paperwork to get his rights restored. He got a voter registration card and voted for the first time in his life in the November 2018 elections. For households that qualify for SNAP, February, the shortest month of the year, was a long one. During the government shutdown, 40 million Americans who participate in the program experienced as many as 60 days between the issuance of their February and March SNAP benefits. The shortages in household budgets meant that food banks across the country were inundated. After their successful five-day special session, the Alabama Legislature has been in their regular session for a few weeks now. The session will end in June, so it is about one-fourth over. Almost one-third of the members are new, freshmen if you will. Even though they are for the most part a bright and talented group, they are still wet behind the ears when it comes to legislative ways. Most are still striving to find their way to the bathrooms. Most major issues, especially revenue-enhancement measures, are addressed in the first year of a four-year quadrennium. Bless their hearts! Right off the bat, they were hit with a major vote to increase the gas tax to support an infrastructure plan. That will make the rest of their first year a downhill slide. In February, the U.S. Environmental Protection Agency (EPA) released its revised “Waters of the United States” (WOTUS) rule. The proposed rule dramatically restricts what falls under the purview of the Clean Water Act, the environmental law that has led to the cleanup of thousands of rivers and lakes in the United States. The U.S. Geological Survey has estimated that the rule would remove federal protections for 18 percent of stream and river miles and 51 percent of wetlands in the United States, putting protections at their lowest levels since the Reagan administration and leaving millions of Americans vulnerable to polluted water. Hank Sanders: Sketches #1659 - Selma must help Selma! I recently wrote a Sketches and editorial about how we must give back to Selma. Giving back to Selma is just one half of what must be done. One half comes from those outside of Selma – from Alabama, around this country, across this world. The other half must come from Selma itself. Selma must give to Selma. I do not claim to have any special knowledge or any special wisdom. However, I will venture a few thoughts. I invite you to share your thoughts, ideas, hopes, and fears. No thought is too insignificant; no thought is too crazy. I share my thoughts in spite of my reservations, my fears and the likelihood of attacks. Last month a federal judge in Texas declared the all-male military draft to be unconstitutional because it applies only to men and not also to women. The decision flies in the face of a decision by the Supreme Court in 1981 that upheld the constitutionality of the draft-registration process. Back then, however, women were not permitted to serve in combat roles, which was the justification for the Court’s ruling. Today, women are permitted to serve in combat roles, a point cited by that Texas federal judge. There is a lot of “libel talk” — and filing of mega-million-dollar lawsuits — in the air, and as long as such stays there, the people’s ability to openly criticize public officials is safe. March is designated as National Women’s History Month. We have National Women’s History Month because the history of women, like that certain other peoples, gets lost in the shuffle of history. Women’s History Month is just a beginning step in recognizing and acknowledging women who overcame great odds to achieve great success. There is an African proverb that says, “Until the lion tells his side of the story, the tale of the hunt will always glorify the hunter.” That’s true of the story of women as well. As long as men are telling the stories, they will always glorify men. It will always be history. Therefore, we will never know the great challenges and achievements of women. Women must tell the stories of women so it will be her story rather than "hisstory." Whoever tells his story or her story makes decisions about what the great challenges were, who faced the great challenges, who overcame the great challenges, and who celebrated the overcoming of the great challenges. We men have one set of criteria for determining these factors. For us men, the criterion is usually about the exercise of power in contests with other men. For women, it may well be other criteria. If the writer does not understand that something was a great challenge, he cannot go to the next steps of who faced, overcame, and celebrated the overcoming of the challenge. I do not know those criteria for women, and I am holding myself back from sharing my perceptions. However, I will offer one example that involves my mother, and every child can speak about his or her mother. March is Women’s History (Herstory) Month. Family is the very foundation of society. It is the most critical institution. However, men rarely tell the overcoming story of family. In my opinion, women usually value the challenges and achievements of family very differently. Our very language is pregnant with prejudices for the male character such as history and heroes. There is no place for "herstory" and "sheroes." My mother, Ola Mae Sanders, was heroic or should I say sheroic. She will not make the usual history books. She was "sheroic" because she met and overcame the great challenges of stifling poverty, a huge family, a limited formal education. and oppressive white supremacy. The Ola Mae Sanders family was not just poor, but “Po.” At one time the family lived in a three-room house with nine children, a mother, and a father. But she led the family in overcoming that poverty. Not only did she eventually do better herself, but all of her children escaped poverty. Every child has owned his or her own home and more. Ola Mae Sanders was sheroic. My mother overcame the great challenges of having a limited formal education. She had a seventh-grade education. Her husband, Sam Sanders, just went to the first grade and could not write his name. Yet, they managed to graduate 12 of their 13 children from high school. (The 13th died as a baby). All but two of her children went to college, and several obtained doctorate degrees. In the face of these challenging circumstances, this was a great achievement. March is Women’s Herstory Month. I have touched on the size of the family, the poverty, and limited education. However, I need to further explore the challenges of a big family. A big family meant not having the kind and amount of food needed. But Ola Mae Sanders took what she had and made what was needed. A big family meant stuffing 11 persons – nine children, a mother, and a father – in three rooms, (a kitchen, a middle room, and a front room). But Ola Mae Sanders took what she had and made what was needed. The family couldn’t afford toothbrushes, but she taught the children to take twigs from a certain tree, peel the bark, chew the end until it became soft and use salt to brush their teeth. Ola Mae Sanders took what she had and made what was needed. Poverty added to the challenges of a big family. A big family added to the challenges of poverty. But my mother met and overcame both challenges. The challenges of poverty, a big family, and a limited formal education were multiplied by the oppressive burden of white supremacy. White supremacy constrained my mother at every turn in what education she could get, what work she could do, what money she could make, what she could accumulate, what respect she could have, what she could say to white folk, where she could go and so forth. It was a heavy burden on her self esteem and the self esteem of her children. But Ola Mae managed to achieve a sense of self-worth for herself and impart a sense of self-worth in her children. Ola Mae Sanders met and overcame these collective challenges. In addition, she became a strong community leader. People came from miles around to seek her wisdom. She had her flaws, but so does every hero and shero. Ola Mae Sanders was sheroic. March is Women’s Herstory Month. History and/or "herstory" acknowledge and celebrate the overcoming of great challenges. Did Ola Mae Sanders not meet great challenges? Did Ola Mae Sanders not overcome great challenges? Is her story not history? Can you see most men perceiving and writing this as history? It is herstory. It is history. March is Women’s History Month. EPILOGUE – Because the victors write the history, I hope more women will see their victories and write their stories so we can have "herstory" as well as history. 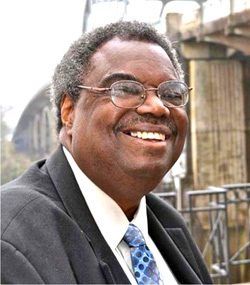 About the author: Hank Sanders represented District 23 in the Alabama Senate from 1983 to 2018. One of the obvious political changes in Alabama government over the last decades with the Republican takeover of the Alabama Legislature has been the reluctance to raise new revenue to fund state government. Many of the current Republican legislators came to Montgomery in 2010 with a "no new tax pledge". Voting for any kind of tax or fee increase was considered blasphemous. In bygone days, powerful governors like Big Jim Folsom and George Wallace would raise taxes at the drop of a hat, especially when it came to a gasoline tax to build roads. It was perfunctory and almost mandatory for a governor to have a road program. That was their legacy and how they and their legislative allies made friends. It was expected that a governor would build roads. Raising the gas tax was the only way to fund a road program. Folks didn’t seem to mind. Looks like this current legislature may have realized that they need a road program. One of the problems exposed during the gas tax debate was the fact that $63 million a year gets diverted out of the Alabama Department of Transportation’s road and bridge funding to pay for state troopers and the court system. The logic (if you can call it that) for this transfer of funds is that the troopers patrol the roads and the courts process the tickets and arrests the troopers make, so therefore, they should be eligible for a portion of that road and bridge funding. Many of those who opposed the gas tax argued that the state should keep that $63 million in the Department of Transportation’s budget and find other sources of revenue for the troopers and courts. On March 20, 2019, the U.S. Department of the Interior (DOI) opened all planning areas in the Gulf of Mexico for the fourth-straight offshore oil and gas lease sale since President Donald Trump took office. Throughout the past 35 years, the DOI has typically auctioned leases in 1 of 3 Gulf sections at a time. But ever since David Bernhardt, the current acting secretary, was sworn in as deputy interior secretary in August of 2017, the whole Gulf has essentially been up for grabs. These Gulfwide auctions are likely watering down the competition, allowing the oil and gas industry to buy up America’s taxpayer-owned mineral resources at fire sale prices—and Bernhardt’s former industry clients are among those who benefit. Within the last few weeks, students attending several Argosy University campuses across the country received a nasty shock: Their campuses would be shutting down in 48 hours. The move leaves thousands of students in the lurch with unclear futures and millions of dollars in missing federal financial aid that the school received from the federal government but failed to disburse to students. Trade is a key to a rising standard of living in society, especially for those at the bottom of the economic ladder. In every exchange, both sides benefit from their own individual subjective perspective. That’s because, at the moment of the trade, they are both giving up something they value less for something they value more. Thus, trade enables people to improve their standard of living. The greater the ability of people to trade, the better off they are. On the whole, President Donald Trump’s Cabinet has not demonstrated integrity, honesty, or accountability to the American public. Four top Trump administration officials have resigned under a cloud of corruption after wasting taxpayer dollars or abusing their position for personal gain: U.S. Secretary of Health and Human Services Tom Price; Environmental Protection Agency (EPA) Administrator Scott Pruitt; U.S. Secretary of Veteran Affairs David Shulkin; and U.S. Secretary of the Interior Ryan Zinke. Rather than cleaning house in the wake of these controversies and resignations, President Trump is doubling down on nominating conflicted individuals to his Cabinet. In February, the U.S. Senate confirmed former coal lobbyist Andrew Wheeler as Pruitt’s replacement at the EPA, the federal agency that enforces air and water protections. And this month, Trump nominated David Bernhardt to lead the U.S. Department of the Interior. Currently serving as the acting interior secretary since Zinke’s departure, Bernhardt is a former oil and gas lobbyist—and has so many conflicts of interest that he must carry around a list of former clients to remember them. 84-year-old Emma Thiessen Alvarez has never forgotten the day in 1981 when Guatemalan officials came to her house looking for her daughter, a student leader who had escaped from military custody. Unable to find her, the officials settled for Thiessen’s 14-year-old son. She never saw him again. Thiesen’s story was highlighted in a recent New York Times article because the Guatemalan legislature is now contemplating granting blanket amnesty to military officials who participated in the reign of terror that the Guatemalan national-security establishment inflicted on the Guatemalan people for a period of some 36 years. Last week, we talked about the importance of roads to economic development. We spoke about urban growth and expansion, especially the need for highways in Huntsville and the improvement of the port in Mobile. Well, I overlooked the need for and importance of our rural roads. Make no doubt about it, our rural roads need fixing too. A good many of the rural bridges in the state have been condemned and are hazardous for heavy trucks and school buses to travel. Many folks figure it would be cheaper to pay more for gasoline than it is to pay for having their front-ends aligned and tires balanced every few weeks from hitting potholes in the road. President Donald Trump’s latest budget blueprint is out, and it again calls for eviscerating nearly every program that helps families afford the basics, including cutting the Supplemental Nutrition Assistance Program (SNAP)—the United States’ largest food assistance program, which helps nearly 39 million people get enough to eat—by a staggering $220 billion, literally shrinking the program by one-third. While presidential budgets are often considered dead on arrival, since they do not themselves become law, one particular proposed cut to SNAP poses an immediate and dangerous threat, given that Trump is trying to sidestep Congress to enact it by fiat. The U.S. national-security establishment’s death star continues operating at full-speed and on auto-pilot. According to an article in Newsweek, the Pentagon and the CIA have now killed half-a-million people since 9/11. The article didn’t say how many of those dead people are estimated to have participated in the 9/11 attacks, but I’d say that a reasonable estimate would be maybe 10 or 20 at the most. That would mean that 498,980 people who have been killed by the U.S. death star since 9/11 had absolutely nothing to do with the 9/11 attacks. When it comes to education policy, Secretary of Education Betsy DeVos and the Trump administration have no new ideas. Much like the Department of Education’s proposed budgets for fiscal years 2018 and 2019, the FY 2020 budget asks for students and teachers to pay for the administration’s misguided policy aims in the form of cuts to education programs. Though DeVos’ education agenda has never been popular, this year’s budget proposal is particularly tone deaf to the needs of students and schools. The Trump administration has been fiscally irresponsible to the extreme, granting enormous tax cuts to wealthy corporations at taxpayers’ expense and letting a costly partial government shutdown drag on. And yet, every year when the budget is released, programs that help students and families seem to come last on its list of priorities, receiving huge cuts or being targeted for elimination. Selma has given so much. We must give back. Selma has given so much to Alabama. Alabama must give back. Selma has given so much to the South. The South must give back. Selma has given so much to the United States of America. The United States of America must give back. Selma has given so much to the world. The world must give back. Selma has given so much. We all must give back. Selma is a powerful symbol. A symbol for struggle. A symbol for overcoming great odds. A symbol for freedom. A symbol for voting rights. A symbol for democracy. A symbol for nonviolence overcoming violence. Selma is a symbol all across this country and around the world. If there is truth in the old adage that “budgets are moral documents,” then-President Donald Trump’s fiscal year 2020 budget is morally bankrupt. It aims debilitating cuts at programs on which American families rely in order to pay for tax cuts, strips regulators’ ability to stop corporate wrongdoers and polluters, and launches yet another brutal attack on Americans’ health care. Every year, pundits declare the president’s budget “dead on arrival,” but Americans should make no mistake: Trump’s FY 2020 budget is a clear statement of his priorities, and its policies are those the president would enact if given the opportunity. And Trump’s priorities and policies reveal his sheer contempt for the “forgotten men and women” for whom he pledged to fight. Gov. Kay Ivey has made infrastructure improvement in the state her cornerstone issue for this year, and more importantly, for her term as governor. Within less than three months in office, she and the Alabama Legislature have successfully accomplished this mission. Last Friday, the Alabama House of Representatives overwhelmingly passed monumental legislation on an 84-20 vote. It was a remarkable victory for the governor and the House leadership. It was a bipartisan coalition of support. Only 18 of the 77 Republicans voted against the bills, and only 2 of the 28 Democrats voted no. It is expected to pass in the Senate this week. Why is racism still America’s biggest problem? It rained on marchers from Selma to Montgomery, Alabama, in 1965, and it rained on them again this month they commemorated the day when police beat civil rights marchers so badly that the date became known the nation over as Bloody Sunday. Fifty-four years have passed since that historic march for voting rights, but as speakers lamented at the commemoration, we are still fighting for the right to vote today. At first hearing, President Trump’s recent announcement of a planned presidential order to mandate free speech on college campuses might seem to be just what free expression advocates would support. However, regrettably, they should not. Keep reading, please. Taking a shortcut through the First Amendment in the name of free speech is not a good idea — and that’s what Trump’s approach will be, no matter how admirable the stated goal of encouraging and protecting the rights of all in university communities to speak freely. I paid 118 percent on a payday loan. The administration is canceling efforts to rein them in. There was a moment in my life when it felt as if everything that could go wrong went wrong — and all at the same time. I had just started a new job. My household went from two incomes to just one, and we were definitely starting to feel it. The mortgage was due, all of the regular household bills and responsibilities were still there, and my son still needed money to cover school and sports expenses. I managed to use the remainder of my savings to pay for everything, but I was still $500 short for my mortgage payment. I was stressed out, trying my best to make ends meet and keep some normalcy in my son’s life. I knew I had a paycheck coming, but it would not arrive in time to avoid all of the late fees and the credit hit for being 30 days late on my mortgage. Hank Sanders: Sketches #1656 - Come with me as I participate in the 27th Annual Bridge Crossing Jubilee! Come with me. Come with me as I participate in the 27th Annual Bridge Crossing Jubilee in Selma, Alabama. I will not go into the months of preparation. I will not share the behind-the-scenes developments. I will just start with the first day of the 2019 Bridge Crossing Jubilee. Come with me vicariously as I participate in the 27th Annual Bridge Crossing Jubilee. Jubilee is comprised of so many events I cannot possibly participate in all or most, or half or even a quarter of these 40-50 events. You are now vicariously experiencing some of my participation. The Pentagon and the CIA and their policy of foreign interventionism are the root cause of the nuclear crisis with North Korea. Keep in mind that we are talking about one country, Korea, which was artificially divided into two halves, North Korea and South Korea. Therefore, the war that ultimately broke out between North Korea and South Korea was actually nothing more than a civil war, one in which the North was trying to reunite the country under communist rule and in which the South was trying to retain its independence. The governor has been inaugurated and the Alabama Legislature has had its organizational session. The quadrennium has begun. It is time for our state officials to get to work. Among the three branches of government, legislative, executive and judicial, our 1901 Alabama Constitution renders our legislative branch as the most powerful. As in many tribal communities, the Swinomish relationship with the environment is complex. The Northwest coastal tribe not only uses the land for food, medicine, and material goods, but many cultural traditions like ceremonies are land-based. The federal government has long attempted to sever tribes from the land — their source of knowledge, culture, and health. Through war and forced relocation, tribes were physically removed. Policies such as the 1887 General Allotment Act forced many to adopt sedentary lifestyles and use Western agricultural techniques. And contemporary legal restrictions on centuries-old fishing, hunting, and gathering techniques mean that tribes are still limited in how they can gather foods and medicines. Can Alabamians support raising our gas tax for better roads while remaining true to our belief in limited government and protecting a beneficial, low-tax environment for our businesses, our families, and our future? Yes … if taxes are lowered elsewhere so that the overall amount of money taken from the people doesn’t increase. The concept is called “revenue neutral tax reform.” It essentially means that if Alabama raises one tax by $100 million next year, then it should have a comparable decrease in something else. Earlier this month, Gov. Kay Ivey announced her plan to spend almost a billion dollars of taxpayer money to build three new prisons for men (there will be no new prisons for women, even though it was the conditions at the women’s prison in Elmore County that started the whole prison debate). There’s no question that the hard-working men and women who staff and run our prison system deserve to have a safe and proper work environment (they also deserve to be paid a whole lot more than they are, and deserve some help in the form of more corrections officers and healthcare staff). But I question any state leader who would choose to spend a billion dollars on prisons instead of education. Why can these companies get away with such behavior, especially in states like Washington where the tipped minimum wage is illegal? The answer is that these workers aren’t employees. They’re independent contractors, and labor law for independent contractors is very different than it is for employees. As self-employed workers, they are entitled to fewer protections, but also, in theory, have a greater degree of freedom and control. The year 1619 does not mean much to most Americans. For those who understand the significance of 1619, it was the beginning of a journey of 400 years of continuous struggle for Africans in America. It is now 2019, and the struggle continues and continues and continues. It was in 1619 that 350 Africans were stolen from the continent of Africa, likely in the area of what is now Angola. They were intended to be taken to Mexico on a slave ship named Bautista. Somewhere in the Atlantic Ocean, the ship was robbed by pirates. A number of enslaved Africans were stolen from Bautista. Of the 350 Africans who left the West Coast of Africa, 147 arrived in Mexico. More than 20 arrived in Jamestown, Virginia. Many died in what was known as the Middle Passage.